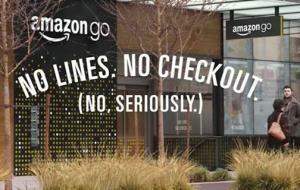 Is Amazon Go™ the Future of Supermarkets? Andrew Tarantola writing in Engadget on October 27th makes a strong case that Amazon Go™ will be the future of supermarket shopping. He recounts the history of innovation in grocery shopping from the 1905 Astor Market in Manhattan which failed. The forerunner of modern supermarkets was 30-years ahead of its time but lacked support. Customers were used to purchasing dairy, meat and groceries in separate specialty stores with interaction with the proprietor and his staff. The supermarket concept was developed by Piggly Wiggly in the early 1950s to cater for suburbanites with autos in the post-WWII era. The innovation comprised selecting items from shelves with payment at a checkout counter. Barcoding was developed in the late 1940s, but was only introduced in the 1970s since it required considerable technical refinement, innovation and acceptance by consumers. Shopping without checkout may appear efficient and technologically beneficial, but consumers will have the last say as to acceptability. If there are snafus in reading codes or if consumers make errors in selection and wish to substitute or cancel an item the system may result in confusion. It must be remembered that over a decade ago, self-checkout counters were introduced with great fanfare. Apart from quick-service lanes with customers purchasing a limited number of items all barcoded, the system has minimal application and is not cost-effective either in terms of labor saving or goodwill. The heading of the article proclaiming that Amazon Go™ will be “the future of supermarkets” may be more presumptuous than prescient.